Posted: Tue 25 Jan, 2011 2:58 pm Post subject: AT-TAC-307 "The Zombie Slayer"
Gus always called this "The Zombie Slayer" when we spoke of it so we decided the name should stick. Also, We will be offering an optional Matching Baldric that I will post pics of tomorrow. Posted: Tue 25 Jan, 2011 6:17 pm Post subject: LOL! It's all in good fun I suppose, reminds me of some of Gus' Atrim Tactical Line. Personally, I think it's pretty awesome. I'd buy one for the right price, even if it's just for the novelty factor. Looks like a fun sword to cut with. I've always liked the looks of the ATrim tactical longswords but never been at the right time to get one while they were available. Is the zombie slayer the first of the production ATrim tacticals that Valiant is supposed to be bringing over, or is it part of a different line? Any estimate on price and date of availability? I'm usually about 60/40 against fantasy pieces, but I like this one. It's a good example of how historical information about weight, proportion, etc. can inform even these flights of imagination. Ingenious grip. I generally dislike tacticals but I also generally loves Gus' swords. maybe one day I'll handle one of his tacticals and be sold but I just can't get past the flat grip yet. aside from that I do LOVE the diamond plate patterned under-wrap. After reading the feedback on this forum and a few others I have decided to add a couple of slabs under the tread plate leather wrap. I will experiment with wood and leather slabs until I find what works best. I plan to keep the tread plate theme and the general appearance that is shown in the pics above. Yes it certainly seems interesting as a design and I could certainly be very tempted depending on price point: I don't expect or even desire a " dirt cheap " price and would rather it cost a little more but be justified by the quality of finish and heat treat. So at a mid range price I would be interested. I don't really expect Zombies to be around to try it on. This one is special.... The Zombie Slayer theme is awesome, and I would love to see more theoretical/fantastical designs. Actually, Gus used Black Acetal plastic for the slabs before, he said it cleaned up easier than the Micarta. We plan to offer those as an option as well. I will mock up a sample in the next few days and post them here. Micarta is certainly modern looking and very durable and can be attractive also but the leather handle does have a nice look to it. Thin carbon fibre slabs could be another option. If the leather is kept for the handle the slabs underneath only need to be a dimensionally stable hardwood wood to keep the cost down. A variety of handle treatments could be good as options maybe ? Hee hee ... I hadn't noticed the 'checkerplate' theme on the grip before ... and the 'biohazard'-ish iconography on the scabbard is hilarious! A couple months ago I got really into the AMC network TV show called The Walking Dead. It was only a partial season of six episodes that was a test run to see if it would generate audience. It did and they're making a full season coming up soon. The show was campy and silly, but I loved it. I looked forward to each episode and am excited to see the new show unfold. Anyway, I can't help but think of this show when I see a "tactical" weapon like this pop up. I can envision it being a pretty successful thing to have in a post-apocalyptic fantasy world. Well, also a Sci-Fi nerd and horror/vampire film nerd and modern tactical design nerd ..... so great handling just makes it that much more tempting. I can keep my historical and hysterical collections in different rooms so that they don't get mad at each other. 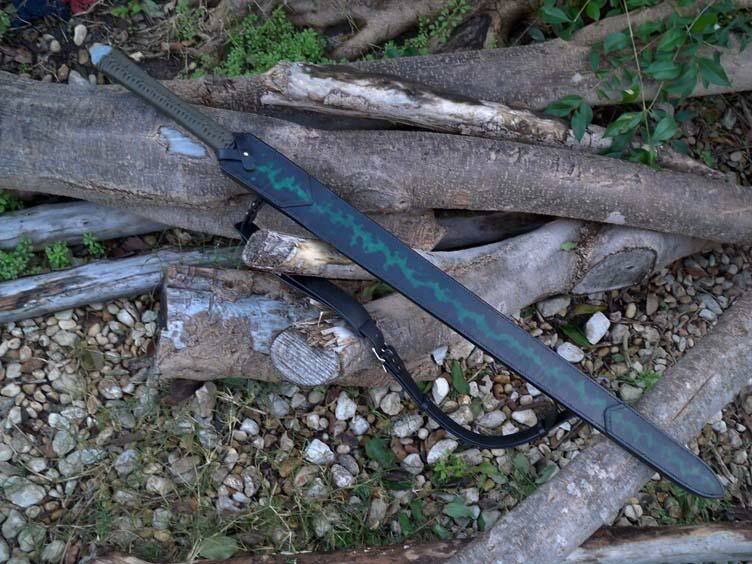 Never go outside without your AT-TAC-307 " Zombie Slayer"
Personally, I can't wait to see how these get customised - not only in the grips, but also scabbard options ... check out this puppy - one of Gus's earlier ATrim Tactical Longswords. 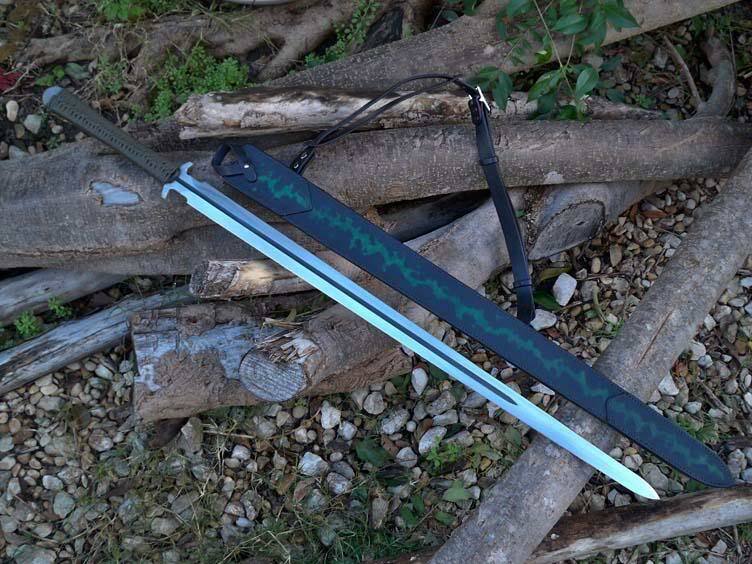 Scabbard is by Dwayne Puckett at Armoralleather - a very talented craftsman ... and pretty good on the 'spooky green lightning' zombie longsword front!